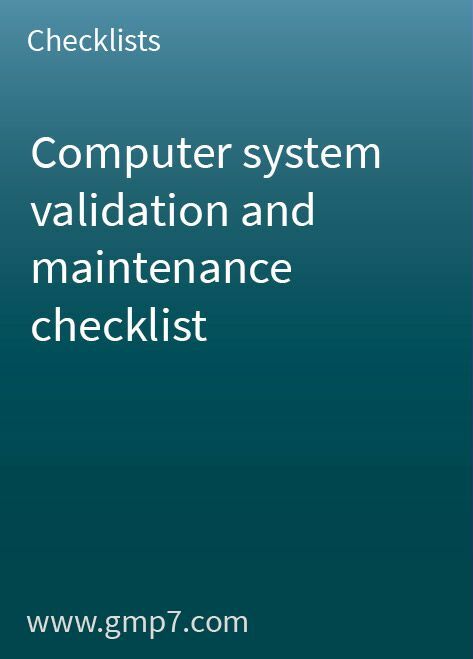 This checklist will enable you to systematically assess the strengths and weaknesses of a computerised system validation using a uniform approach. A scoring option is included which enables you to compare different systems and helps you to judge the compliance status of these systems. The checklist, which contains more than 80 questions, can be used to evaluate potential validation contract vendors/suppliers (front cover letter included). This checklist was created in line with regulatory requirements such as FDA 21 CFR Part 211.68 Automatic, mechanical and electronic equipment, modified FDA 21 CFR Part 11 Electronic records and electronic signatures, FDA Guidance for industry: Computerised systems used in clinical trails, European Guide to Good Manufacturing Practice (1992) Annex 11 Computerized Systems, PIC PH 1/97 Guide to Good Manufacturing Practice for Medicinal Products (Feb. 1997) Annex 5 Computerised Systems, the Blue Book (FDA), PIC/S Guide to Inspection of Computerised Systems, the APV Guide to Annex 11 (EU), GAMP Guide to Validation (EU and FDA) and PDA Technical Report 18 (FDA).